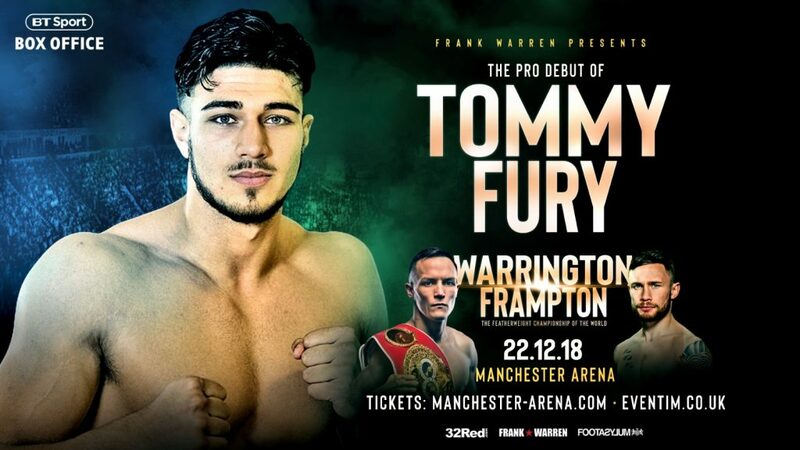 New professional Tommy Fury is utterly convinced his brother Tyson will return from Los Angeles as the proud holder of the WBC world heavyweight title. The undefeated lineal champion Tyson goes in against the 40-0 WBC ruler Deontay Wilder at the Staples Center on Saturday night in a bid to claim the one belt to have eluded him so far. Following a lengthy hiatus from the sport after his de-throning of long-standing champion Wladimir Klitschko in 2015, the accepted wisdom is that this is a tall order for Tyson after just two relatively low key comeback fights. The mission being undertaken by his senior sibling holds no fears for the 19-year-old, who firmly believes his brother holds all the aces going into the biggest fight of the year. “If anyone is going to do it, it will be Tyson and he will do it,” insisted Tommy, who makes his professional debut at the Manchester Arena on December 22. “There are no ifs, buts or maybes, he will do it because, like I have said many times before, the only reason this fight is competitive is because Tyson had two and a half years out of the ring and he abused his body. “That is the only reason why this fight is even close. If he had come off the Klitschko win and fought, this would be a breeze and a 95-5 fight. “Wilder has got a right hand, a left hook and he’s got a bit of pace. You can’t beat a man with everything in the book with just that. “You need more than power. Look at Wilder, he doesn’t feint, he doesn’t prize you open, he just comes, lands a big right hand and it’s over. If you have got a person slipping and sliding, left and right all over the place and you are loading up and can’t land – you are going to get tired in the late rounds. “That is what I have said, Tyson will stop him late on, between 10 and 12 rounds,” predicted the youngest of the fighting Furys, who suspects the Wilder camp are banking on Tyson’s inactivity counting against him. “I do think he will break his heart and Wilder is thinking if he is going to do it has got to be now because he has had two comeback fights against low level opposition. He will think this is his time. “When he comes out and sees Tyson just as good as he was in 2015 he will know he is wrong. When he can’t land those punches he is not going to do very much. He will have nothing left. “Tyson has ballooned up before and come down. It is not even about fitness for him because I have seen him in the gym at 30 stone doing 15 rounds. I wondered how it was possible. “I honestly believe if he is 25-30 per cent of what he was in 2015 he will wipe the floor with him because he has got too much skill for anybody out there. Joshua, he is stiff and doesn’t really move his head and you see the punches coming from a basic boxing style. “That is why I think Wilder is a harder fight because he would beat Joshua in my opinion because he is unpredictable. With Joshua you know what he is going to do, he is going to start fast, then he tends to fade in the later rounds and then comes on strong again. “Wilder swings a lot and is fast, plus he hits harder, so he is an all-round riskier fight. Tommy himself will be keeping the home fires burning on the night and not travelling to LA due to preparations for his own big night being underway, but he reckons Tyson could even run solo and still emerge victorious. “I will be staying here to train because I’ve got to look to my own career at the minute, but he will do the job. He could go over by himself and do the job because he is that type of person. Watch Wilder-Fury live on BT Sport Box Office on Saturday night.